This is the best cocoa powder I have ever used. I have always bought Hershey's cocoa powder (different variations) and none of it comes close to the richness and deep chocolate flavor of this. I will be buying more of this. Excellent quality! The smell and color was amazing. Used this to make a higher quality hot cocoa mix, and it was a hit! Plus, for this price, it was cheaper than what I find in my local grocers. Would definitely buy again. Love this product! Has great flavor, so smooth and rich, it makes all of our yummy goodies taste divine. We will purchase this again in the future! My goodness…this is NOW my cake, cookie (and coffee) cocoa powder of choice! Maybe I should’ve attached pictures, but who could wait till the cake cooled to do that? The aroma of that rich chocolate filling the room will certainly have you salivating . When you open the lid of this Giradelli Majestic cocoa powder, a part of you would want to notify your people of this find, but a greater portion would want to keep it a secret so that you would become famous for having the best chocolate goodies ever! i’m glad that I ordered two containers, because Webrestaurant has the best prices and delivery on the internet, I’ve found. Even though Webstaurant offers quite a few cocoa powder options, I went with this one because it was their most decadent variety. I’m so serious about my brownies, and there’s nothing worse than bland, underwhelming ones that you so meticulously tried to bake. Starting with key ingredients is the most important step, and it really sets your recipes apart from other bakers (well, in my case, other stay at home wives lol). Just like a good quality vanilla extract, the cocoa matters too! Trust me, once you opt for something more rich like this one, you won’t be buying the generic grocery store brand anymore. this is far and away the best cocoa powder i've ever used. the flavor is super rich and chocolately but not overpowering. if you were to buy this container in a store it would be much more expensive so this is a great deal. This cocoa is amazing. Wonderful rich chocolate flavor and incredibly diverse. I use it for everything from ganache to chocolate cakes to chocolate buttercream and more. Highly recommended! We use this at the bakery where I work and it is delicious. Everyone raves over our chocolate cakes and I know this cocoa powder is why! Such a deep rich chocolate flavor. Now I can use it at home too thanks to Webstaurant.com. Great quality cocoa powder. I have used it for my chocolate cakes. Delicious! I highly recommend from webstaurant. Amazing deal for amazing products. We love webstaurant! This coco is rich and makes for an amazing chocolate cake. It also gives my Chocolate Buttercream and a nice rich flavor. A little goes a long way. Rich and bold flavors, high quality, dark and aromatic cocoa powder, no sugar added - and it is almost half price when compared to other online retailers. This chocolate is fantastic. It made my chocolate cake dark and moist. It was a great flavor, richer than I am used to, using regular Hershey cocoa. Great quality and great price! Its a beautiful deep brown color. I use this cocoa power in my made-from-scratch chocolate buttercream and it's a huge hit! Might as well be gold - that's how good it is. It is naturally sweet, smooth, velvety, and rich in flavor. The price seems steep but the high quality makes it a bargain. It gives a competitive edge without changing the recipe. Absolutely a great find! I have made cookies and cake using this cocoa powder and the both turned out a super chocolaty and rich flavor. Ghiradelli is a great quality chocolate. Webstaurantstore price is good too. We use this in cupcakes. Great quality ingredient makes you different and better than competition. 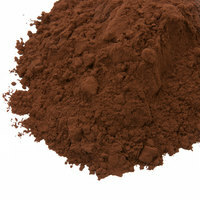 This is a beautifully dark and rich cocoa that I use in cupcakes, frosting, chocolate glazes and cookie doughs. Ghirardelli is a name that I trust and this cocoa definitely lives up to expectations. A great price for the quantity and quality. This makes the best brownies and chocolate cake imaginable!!! It has a rich chocolate flavor, not that distinctive fake chocolate bar flavor as the so called leading coco. Great value also.